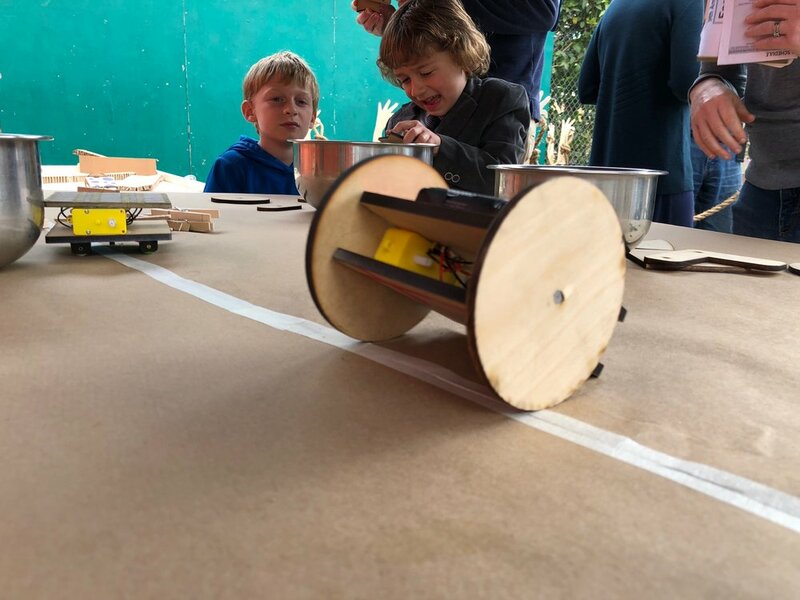 Exploring Motion at EB Maker Faire 2018 — Wonderful Idea Co. 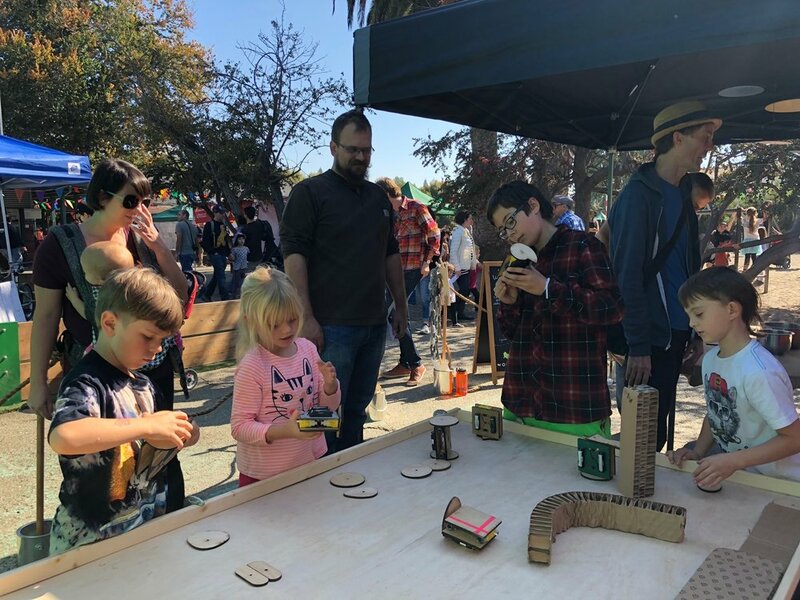 This past weekend we participated in the annual East Bay Maker Faire by setting up a pop-up tinkering environment to explore motion with little scrappy bots. We’ve been experimenting with a set of interchangeable parts that use DAGU gearbox motors, 3 position DPDT switches and a bunch of different shaped laser cut wheels. For the event we expanded our normal 10’ by 10’ space and added an extra testing arena where learners could test out their machines in a collaborative environment. We built a new system for little wooden hands and thick rope to help create a protected workshop. Nicole also created a knitted chain-link fence that added a friendly and playful entrance to the activity space. 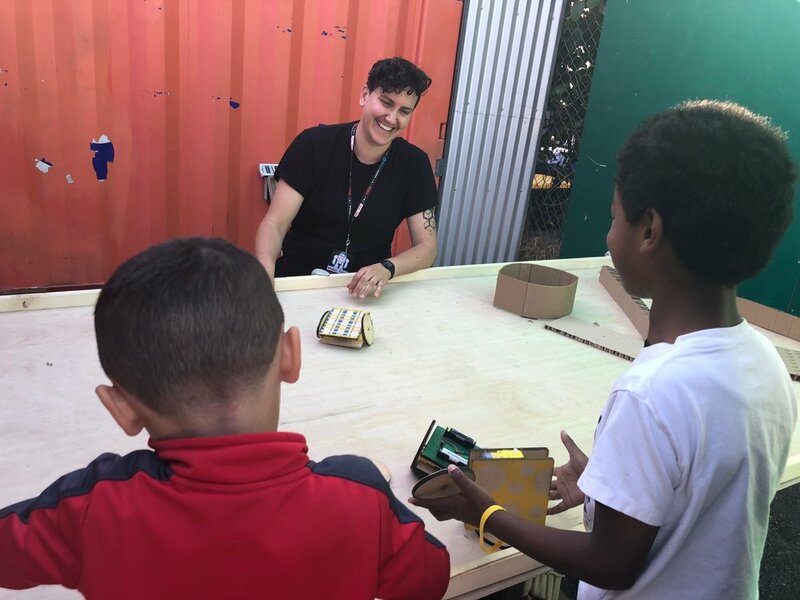 The micro:bit/moto:bit bubble machine also provided an engaging installation for people to play with alongside the main activity. This whimsical machine encouraged a lot of curiosity about coding, computation and how to combine physical and digital materials. One fun test for the Maker Faire was to create a chalkboard sign with an illustration of the motion boards, the names of all the parts, a diagram of the circuit. Instead of creating a paper handout we encouraged people to take photos of the machines and hopefully build their own version back at home. The motion boards worked well as a (mostly) unfacilitated activity station. We spent a lot of the time just observing to see how people used the machines. There was a bit of a challenge with the lasercut wheels loosening over time and not having a strong press fit. We’re thinking about working on a new way to connect the hub. Over the course of the day there were so many fun engagement with kids and adults. The little boards allowed people to quickly iterate on their ideas and create unusual designs. Other young makers spent more of the time putting together cardboard barriers, archways and ramps for the machines to navigate. It would be fun to try to further develop the idea of building an environment for the boards. The Maker Faire always gives us a great chance to collaboratively prototype workshops with learners of all ages. 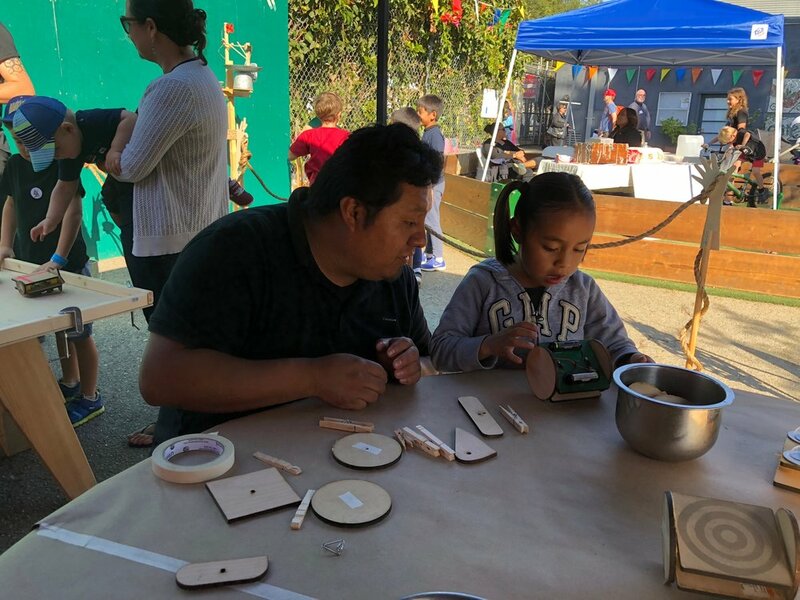 Although it’s exciting to rapidly test out the elements with so many makers over the course of the day to see what works well and what parts fail, the most fun element was all the great ideas that kids and adults shared with us. We’ll keep working on these scrappy motion boards with learners in Lodestar schools and in other pop-up tinkering settings over the next few months. Stay tuned for the latest updates on these fun machines.